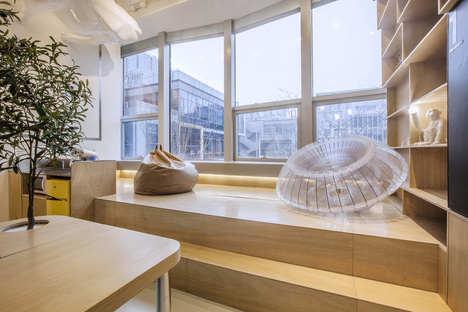 An office that makes its occupants feel at home through its simple but refined interior design created by the Towodesign team in the district of Minhang, Shanghai Qibao Vanke International. 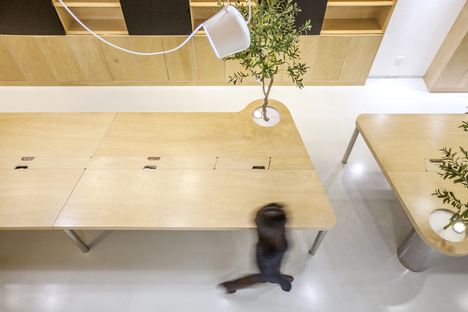 Talking about work after the holidays might seem a bit traumatic, but an office like the one that the designers from the Chinese studio Towodesign have created for themselves in the Minhang district, Shanghai Qibao Vanke International is a real game-changer. Because the idea of spatial storytelling is also making its way into the interiors of workplaces with the creation of rooms and areas that streamline work processes and at the same time optimise the wellbeing of the occupants. This is all the more true when it comes to the premises of the firm in question, in other words, a calling card that allows TOWO to communicate its values and ideas. The result is a really surprising place in a rectangular layout, what ends up being an interior landscape focusing on creativity, dominated by the warmth of light-coloured wood with plants integrated into the furniture and consequently the indoor environment. 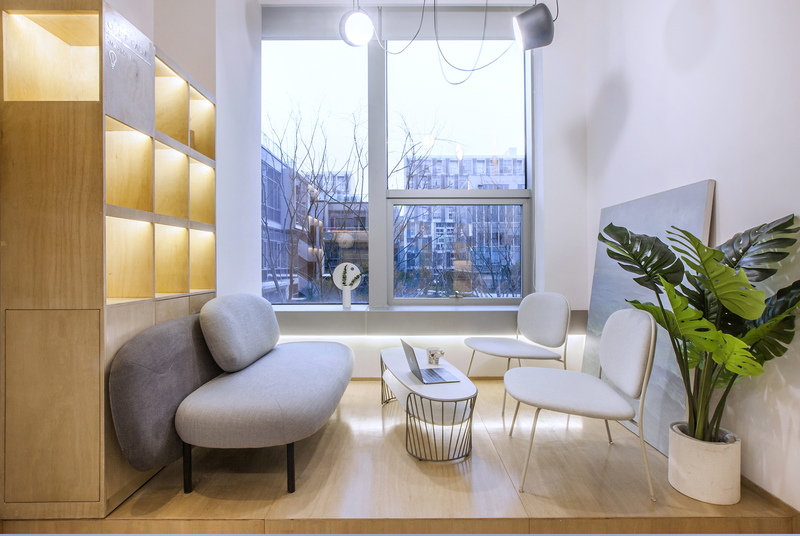 We all know that greenery is good for us and when you add views of Shanghai through floor-to-ceiling windows in the breakout area and relaxation corner with comfy seating, you get the impression of being in a scenic lookout rather than an office. Obviously, even if it is designed by creative people for themselves, a workplace cannot be devoid of certain standard features, like a meeting room. TOWO responds to the architectural limitations caused by the low height of this room with a reflective ceiling incorporating an air conditioning system combined with eye-catching lighting. Because if it is not possible to hide technical systems then why not showcase them in all their glory. The concept of combining beauty and functions fills the whole environment here, along the lines of the proverbial phrase “when life gives you lemons, make lemonade.” Which you can see not only in the meeting room ceiling but also in the tables throughout the offices. TOWO has designed them to make the most of the space and assure ease of use, crafting bespoke furniture to accommodate the position of the walls and streamline the interiors. Creativity and fun are by all means the order of the day in this project by TOWO. Every functional element of the space is interpreted as a symbol, so the wooden door of the restroom is enhanced by a relief motif to turn it into a decoration. And although the shelves are a bit dull out of necessity, well too bad, you can always fill them up with something special. The TOWO team of creatives have turned their offices into a showcase for the design approach, which is to think out-of-the-box, knowing the container so well that they can challenge premises and come up with attractive and functional solutions for an environment where you are happy to work!